Approximately 20% of adults snore, a number that rises to about 60% when talking about men over the age of 40. With so many affected, it’s easy to think of snoring as simply an annoyance for anyone sleeping in the same room. For many snorers, this is the case. For others, snoring is linked to some very serious health conditions. Snoring is basically a result of soft tissue in the throat narrowing the airway. As the sleeper breathes, the uvula and soft palate vibrate. There are several things that can cause snoring. 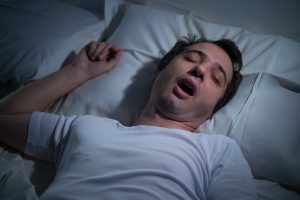 Sleep apnoea – For some people, tissue can partially or completely obstruct the airway, causing an individual to stop breathing for several seconds. This can happen repeatedly throughout the night, and is typically followed by a characteristic loud snore as the person struggles to breathe. Age – With age comes loss of muscle, which can make it harder for the muscles in the throat to keep the airway fully open. Weight – Excess fatty tissue in the throat, especially when combined with poor muscle tone, can further restrict airflow. Alcohol, tobacco, and medications – Any of these can relax the muscles in the throat and cause snoring. Smoking can also cause the airways to become irritated and inflamed, decreasing air flow. Sinus problems – Seasonal allergies, sinus infections, and respiratory illnesses can all cause inflammation of the airways, further restricting airflow. Sleeping position – Sleeping on your back places you in a position that makes it easier for tissue in the throat to narrow the airway. Sleeping on your side makes it easier to keep the airway open. If your snoring is associated with sleep apnoea, the consequences can be far more significant than waking your partner. Daytime sleepiness – Sleep apnoea interrupts sleep, but doesn’t fully wake the individual. Because of this, sufferers are often tired during the day, despite thinking they slept all night. You may also sleep lighter in a subconscious effort to keep the airway open. Low blood oxygen – Whenever you stop breathing, oxygen levels in the blood drop. When this happens repeatedly, as with apnoea, blood vessels in the lungs can become constricted, leading to pulmonary hypertension. This can also cause frequent morning headaches. Heart problems – Sleep apnoea can contribute to high blood pressure, which can increase risk of heart attacks and strokes. People with sleep apnoea are also more likely to experience arrhythmias. These changes in heart rhythm are generally harmless, but can be a concern in people with sleep apnoea. If your snoring is a sign of sleep apnoea, treatment could improve your health and quality of life. Even if your snoring is benign, getting it treated could improve your home life by helping your partner sleep more peacefully. Fortunately, most cases of snoring can be treated easily. Sleeping on your side can help. Limit your intake of alcohol and avoid sleeping pills and smoking. Alcohol and sleeping pills can relax the throat muscles, making it harder to keep the airway fully open. If these don’t help, a custom fitted oral appliance can open the airway by gently pulling the lower jaw forward and preventing the tongue from falling back. To find out more about how you can put a stop to your snoring, call to arrange an appointment on 07 3278 0580 now.